SoftWriters is and authorized re-seller for Zebra and SATO printers. The larger industrial models hold more labels than the desktop models, and are designed for higher volume environments. The desktop CG412 has a 4” print width with 305 dpi resolution. The CG Series feature easy maintenance with an antimicrobial casing, EASY print head replacement and Drop-Load-Go media bin for fast roll replacement. The CG412 can be used for your larger prescriptions and IV labels up to 4” wide. The desktop CG412 has a 4” print width with 300 dpi resolution and print speed of 4 ips. Features user-friendly operation and serviceability and comes in both Thermal Transfer and Direct Thermal models. Prints labels, receipts, tags and wristbands. 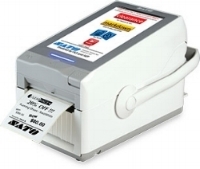 A mobile, direct thermal intuitive all-in-one label printer features a 7” color smart touch screen and 305 dpi resolution. Wireless connectivity with AEP (Application Enabled Printing) software and battery operation option provides freedom to work where needed.